This is my version of Baba Ganoush an Arab dish traditionally made with eggplant that can be used as a sauce, spread or dip. Although the traditional version requires eggplants that have been grilled or scorched we can get really close to this flavor with the pressure cooker! What you lose in “scorch” you gain in the amazing eggplant flavor that the pressure cooker naturally preserves and enhances. I open all of my pressure cooker demos and classes making this dip because this recipe showcases how quickly and easily the stubborn eggplant can be prepared. With this recipe, I show that you can brown in a pressure cooker, air-free cooking and how food’s own liquid can be used for the cooker to reach pressure. Before even starting I pass the eggplant(s) around have everyone feel their heft – they’re over 90% water. That’s liquid that can be used to help the pressure cooker reach pressure. Also, take a look at the step-by-step photos of this recipe. You’ll see the dip is “lighter” than it is in the final photo. That’s because vegetables don’t oxidize during pressure cooking. Instead, this dip starts changing into a dark velvety “eggplant dip “color as you scoop it out of the pressure cooker into the dish, when it is exposed to air again. The live color change always gets lots of “oohs, and ahhs” from demo attendees. Most importantly, the real reason I make this dip – as I hope you will discover- is because it’s simple to make and absolutely delicious. This dip disappears from the demo counter really quickly! Although we usually recommend saving and using all kinds of veggie juices – eggplant is the exception. The juice is bitter, brown and unpleasant. You’ll want to toss it. Peel the eggplant in alternating stripes of skin and no skin (to keep some of the flavor and color of the skin, but not too much!!) Slice the biggest chunks possible to cover the bottom of your pressure cooker. The rest can be roughly chopped. In the pre-heated pressure cooker, on medium heat without the lid, add the olive oil. When the oil has heated, carefully place the large chunks of eggplant "face down" to fry and caramelize on one side, about 5 minutes - throw in the garlic cloves with the skin on. Then, flip over the eggplant add the remaining uncooked eggplant, salt, and water. For electric pressure cookers: Cook for 5 minutes at high pressure. Take the pressure cooker base to the sink, and tip it to remove and discard most of the brown liquid. Fish out the garlic cloves and remove their skin. Add the Tahini, lemon juice, cooked and uncooked garlic cloves and black olives and puree everything together using an immersion blender (tilt the pan to get everything in the nook so it immerses the head immersion blender). Pour out to the serving dish and sprinkle with fresh Thyme, remaining black olives and a dash of fresh olive oil before serving. Since it’s original publication, in 2011, this recipe has been refreshed to work with electric pressure cookers. The accompanying article has been completely re-written, too. If you preferred the original recipe for stovetop pressure cookers only using the “scorch method” you can view it here. This recipe looks absolutely amazing! 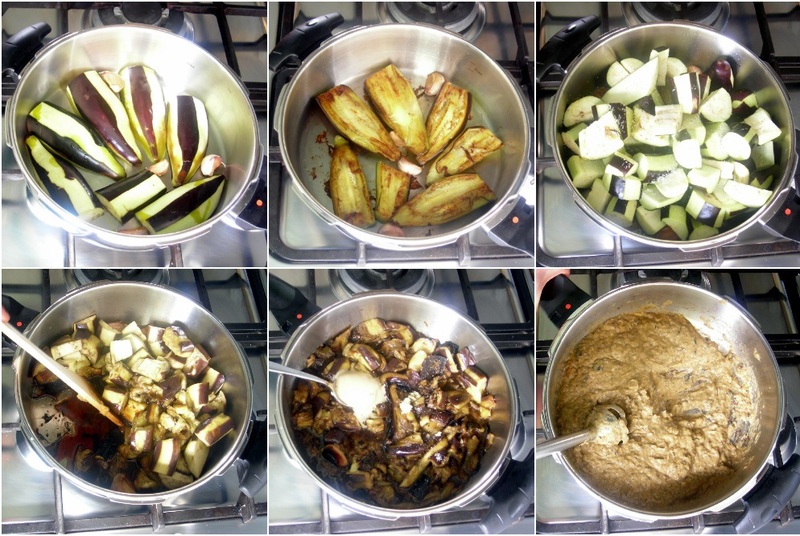 I never thought to make my own baba ganoush, and certainly not in my pressure cooker! I have a jiggly top PC so I’ll let you know how it turns out! Hi JL, let me know how it works out. This just might be anoter pressure cooker first, too. Hope my readers aren’t getting tiered of reading that. But there are so many great things that can be done with this pan that I won’t be running out of “firsts” for a long while. I love babaganoush! Your dish and photo are so gorgeous. Thanks for this recipe — I LOVE baba ganoush but can never commit to making it. The pressure cooker would be a lovely shortcut. Amy, the scorching will damage your insert. As I noted in the recipe, please do not try this method in your Electric Pressure cooker. The sky’s the limit when it comes to your skills with pressure cooker. I only have 1 pound of eggplant from my produce box. Will it be okay to half the recipe. Also no water. Guess this is okay. It should be safe to halve the recipe – depending on the size of your pressure cooker and the minimum water requirements. Two lbs of eggplants have almost 32 oz. of liquid in them – the trick is how quickly it is released. Just to be safe, I would add a Tblsp. or two of water to help the process along! This is similar to your demo recipe for eggplant and olive caviar which was so AWESOME! That recipe and demo told me I needed to get a pressure cooker. The recipes following this were just icing on the cake. Yes, the garnish for this recipe was the inspiration for actually integrating those ingredients in the demo recipe with a little extra lemon, too. The demo recipe is less complicated since I added a little water to reach pressure, and then poured out the extra after pressure cooking. This one, however, is even more “scorched”! I have an electric pressure cooker that came with a non-stick insert. I have replaced the non-stick insert with a stainless steel one (ordered from amazon.com). But I could not get this recipe to work. It seems that the electric pressure cooker can’t handle scorching and the electronic control feedback loop gives up. So it’s not just about damaging the non-stick insert. Saw this same recipe on the Fagor website – with the addition of 1/2 c. water. It states at the end “Recipe and image contributed by: http://www.hippressurecooking.com“. That works. But the end result is predictably too watery. I drained the liquid out and proceeded with the rest of the recipe. I wrote this recipe before there were electric pressure cookers with stainless steel inserts. : ) Thanks for bringing it to my attention so I could update the article. This is a special technique recipe, but when I give recipes to manufacturers they need to be no-fail and to work with every kind of cooker. Yes, draining is what I do with another variation of this recipe that I make at my cooking demo tours. I really like to show cooks how the eggplant doesn’t oxidize at all (it stays white) during pressure cooking because of the oxygen-free environment in the pressure cooker and only begins to turn brown AFTER you open the cooker and puree’ it. I wish to change my non-stick insert as well. What brand name is your electric pressure cooker? I have an Elite pressure cooker and it sits in the pantry rarely used because of the non stick coating. I would love to know if anyone with this brand of pressure cooker has switched to the stainless steel insert. Brilliant recipe. I thought at first that leaving some eggplant skin on the eggplant would effect the texture of the dip but no the pressure cooker made the skin very tender and it blended well with the rest of eggplant. At the moment eggplants are $2 (Aust.) Per Kilo ( about $1 per pound) so I am making as many eggplant dishes as I can – I love eggplants! I recently purchased a WMF pressure cooker – the one you reviewed – based upon your review. I am extremely happy with the cooker. Your meatballs recipe has become a family favourite. I can’t access the “old” recipe. See http://www.hippressurecooking.com robots.txt page. Learn more about robots.txt. Hi! Any ideas of what we could sub for the tahini? We have a sesame allergy in the family unfortunately! Hi Leah , there is a Greek version of this dip – Baba Ganoush – called Melitzanosalata which does not contain Tahini. 3 tablespoons of lemon juice. Note, In Australia 4 teaspoons equal 1 tablespoon. In America I believe 3 teaspoons equal 1 tablespoon. So you will need to adjust. But the cup sizes are pretty similar. 1 small onion , grated. I use onion about size of golf ball. 2 tablespoons of chopped parsley. I use flat leaf parsley. Also called Italian parsley. Thanks for sharing this variation Phil! It looks delicious. I didn’t have any olives or a lemon. I had a fresh grapefruit, so I substituted that for the lemon. My kids ate ALL of it. I put a bowl of pita chips next to it and they DEVOURED it. Will do this again. So simple. Made this yesterday in the instapot .Turned out amazing !! Served with toasted Pita bread . Just made this, as an IP newbie, and it turned out great. I made one addition, because I’m used to a more roasted eggplant flavor in babaganoush: 1/4 to 1/2 teaspoon liquid smoke when you’re blending everything at the end. Now I need to hide this from myself or I will eat all of it! I think you just upped the addiction factor of this dip with the drops of liquid smoke – will try this with my next farmer’s case which I’ll pick up in a couple of days. Made this today, I have made many similar recipes over the years, but this may be the best one yet, and by far the easiest! Thank you for all of the great recipes. A HUGE THANK YOU for yet another amazing recipe, Was an absolute hit with the kids and the hubby, extremely delicious, always a huge plus when they eat whats on offer with minimal fuss, plus I’m always looking for many ways to use different fruits and veg, just to mix it up. 1) Do you use the japanese eggplant. Or the darker larger ones? 2) The olives say pitted – but then they get added and put under the immersion blender? Do you leave them unpitted to measure them and then pit them when adding. I’m new to pressure cooker and cook with less oil. If I leave the oil out will change the pressure cooker process? Thanks – this is a great site. Vic, use the regular round eggplant. You can measure the olives un-pitted and then pit them – they take up the same amount of room in the measuring cup. Well, the eggplants won’t brown without ANY oil so you’d just get “boiled” eggplants. How about you put in at least a drop of oil and wipe it around with a paper towel to get a little singe? This recipe looks great! Thank you so much for sharing! Hi, what type of black olives are used for this recipe?